The midsummer’s sunset metro line. Over the centuries the good people of Delhi have painstakingly learned to cope with stifling summer heat. But it’s admittedly hard to form some sort of friendship with the harsh sun. What may be easier is seeking out a tentative bonding at sunset from any number of enchanting viewpoints in the capital. 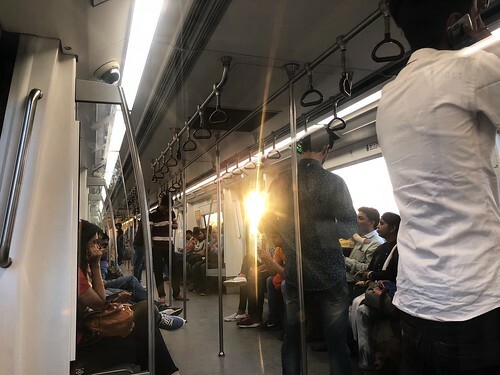 Alternatively, you may like to experience a twilight trip on the Blue Line, boarding the westbound Metro train at Rajiv Chowk. Shortly after boarding, as the train emerges from the tunnel, you’ll immediately spot the burning-red evening sun glinting behind ramshackle buildings and roofs of Paharganj and Karol Bagh — on the right-side windows of the coach. At other times the sun casts pools of golden light illuminating the faces of commuters. A tired 9-5 office-goer suddenly appears as something more than merely mobile phone mortal — a brief illusion that jolts the mind. As the train moves forward it seems as though the driver is determined to catch the sun, as though everyone in the coaching is moving towards it. Just another illusion, of course, but perhaps worth experiencing in the knowledge that even illusions can be hugely comforting. Somewhere between Shadipur and Kirti Nagar the train whisks past ordinary highrises that now are drenched in golden hues. Other times the sun plays hide and seek with the commuter’s sensibilities, appearing now and then between buildings, now vanishing, now re-appearing. And vanish it finally does, as gentle eve settles upon the vastness of a city now, at long last, cooling off. The most beautiful ‘sunset trip’ may be had on the Yellow Line where the train pops up in the wilderness near Qutb Minar. On cloudy or rainy days I get off at Qutb Minar station and direct my gaze towards that most beautiful of all Delhi landscapes : the gently undulating green of the Aravali hills dotted with tombs and gardens.